Water changes involve removing a certain amount of pond water and replacing it with fresh mains water. When speaking with fellow pond owners, I’m sometimes surprised by how many don’t actually carry out regular water changes, or even worse, never seem to perform them at all. Common problems I tend hear, such as issues with water clarity, slow koi growth, or sick fish, are often caused, at least in-part, by a lack of proper water change routine. Just like aquariums, ponds are closed eco-systems, which means that both organic and inorganic substances that enter the pond will eventually end up being deposited, gradually leading to background pollution, poor water quality, and weaker fish. For example, we run filters alongside our ponds to house millions of beneficial bacteria, which work to break down harmful ammonia and nitrites from waste into less harmful substances – a process called the nitrogen cycle. However, in this example, after both ammonia and nitrites have been broken down we’re still left with something called nitrates, which can’t be broken down further by biological filtration. Although nitrates are less harmful than ammonia and nitrites, they can still become toxic in high doses, and will also cause issues with water quality, water clarity, and fish health if left unchecked. Since there is no longer any natural way to further reduce this substance, it will need to be removed manually by us through regular water changes. Likewise, any chemicals, treatments, or medicines we add to the pond will eventually end up as residue after their degradable ingredients have been broken down. What you end up with is a growing “chemical soup”, which can only be properly controlled with a regular water change routine. Why Carry out Water Changes? What are the Benefits for Koi? Regular water changes will help reduce nitrates, chemicals, and heavy pollutants that can cause issues for fish. Nitrates are readily used by plants as natural fertilizer, but plants consume only a small portion of overall nitrates in fish ponds due to the volume of waste produced. As well as this, ponds are considered closed eco-systems, which means eventually you will end up with substances being deposited in the pond which cannot be broken down via natural processes. Nitrates are one of these substances, and those that aren’t used by pond plants, simply start to accumulate within the pond unless manually removed. Although nitrates are far less dangerous in comparison to ammonia and nitrites, they can still become a major problem if levels are left to rise. Just like with ammonia and nitrites, nitrates in high concentration will eventually lead to sores, burns, and incredibly stressed fish. Excess nitrates will also lead to other issues, including the rapid growth of algae, which will quickly deplete dissolved oxygen and contribute to organic waste. As well as removing nitrates, water changes will also help remove any chemicals, pollutants, or residues from treatments or medicines. Many inorganic chemicals can’t be broken down naturally, and like to linger within the pond long after the treatment has been finished. Performing regular water changes allows you to stop this from happening and the substances interfering with water quality. Fish produce an almost constant amount of ammonia and waste, which biological filtration (and water changes), will help neutralize. However, they also produce a large quantity of pheromones and organic proteins which work to inhibit the growth and increase stress of other fish within the pond. In fact, from personal experience keeping koi for many years, I’ve noticed first-hand that koi in ponds which were subject to a higher volume of water change grew healthier than koi in more static conditions. 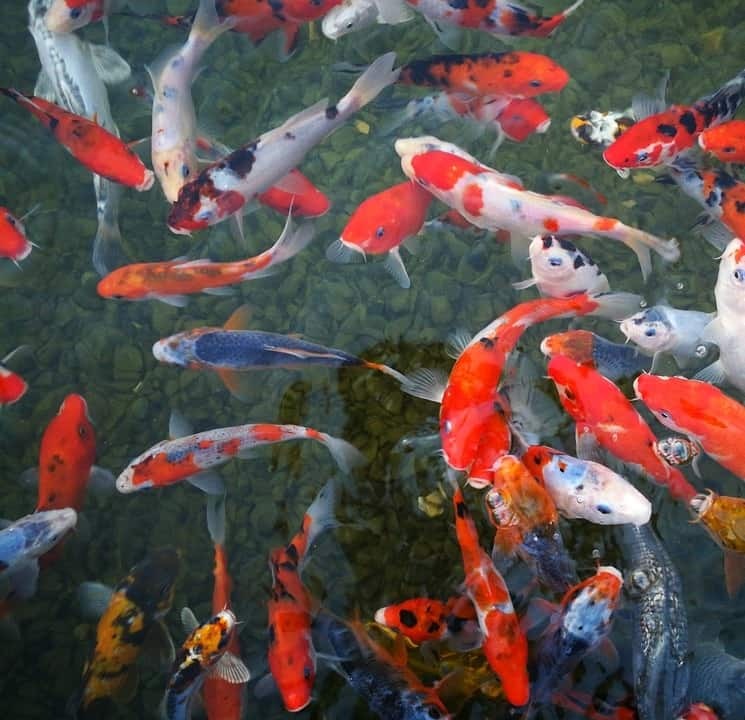 In particular, the chance of koi contracting illness, infection, or parasites appeared to be much lower in ponds which had very regular water changes; leading to the conclusion that the reduction in waste, proteins, and pheromones is beneficial to the health of fish. Similar findings have also been observed in research studies that show that lower koi stocks (less fish) grow larger than koi in heavily stocked ponds, likely due to less waste, stress, and pheromone production. As a final benefit, koi and goldfish require trace minerals which will eventually be depleted unless fresh water is added to the system. Minerals such as calcium, silica, zinc, iron and magnesium are required in small quantities for healthy growth, bodily functions, and immune activity. These can be found naturally in all types of mains water, with soft water having less minerals and hard water having more. Water changes help replenish these trace elements without the need of additional products or treatments. Water changes remove harmful waste substances, but also introduce toxic chlorine to the pond system if not treated beforehand. Although water changes are always recommended if you have fish in your pond, there are still drawbacks that need to be considered. For example, water changes may remove a good chunk of organic waste substances from the pond, but they can also introduce a new inorganic substances that can be equally as toxic, such as chlorine. For this reason, mains water should always be dechlorinated before it’s added to the main pond, especially if you carry out frequent or particularly large water changes. Alongside chlorine, which is actually easy to remove, you have a more modern, but just as potent, new substance called chloramine to consider. Chloramine is the chemical combination of chlorine and ammonia, resulting in a strong disinfect that doesn’t evaporate like chlorine and remains active in water for a very long time. Older treatment methods, such as letting water stand or boiling, no longer work on mains water containing chloramine, so specialised treatments need to be carried out to effectively remove it during water changes. In terms of the frequency of water changes, this would depend on your fish stocks, pond size, filtration quality, and various other factors. There is no “magic number” when it comes to changing water, and the best way to determine the frequency is to carry out regular water quality tests and change water accordingly. For example, if you perform a monthly water quality test and your results are showing higher than normal nitrate levels, you may need to increase your water change frequency from once a week, to twice a week, to help combat this. Q. Frequency vs Volume – Which is better for Koi? Koi are sensitive fish, and are most comfortable in a highly stable environment with as little environmental change as possible. 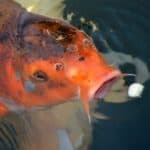 For this reason, many leading koi experts believe that more frequent, smaller water changes are better for koi in comparison to much larger, irregular water changes. This is because every water change will have an impact on the eco-system, and by carrying out smaller water changes at more frequent intervals, you’re giving the koi an easier time to adjust to the new conditions. However, not everyone can carry out a water change every day, so performing a larger weekly water change is still better than no water change at all. The ultimate goal of water changes is to reduce harmful substances and chemicals, so we recommend finding a balance between volume and frequency based on the results of water quality testing and fish heath. For example, if your tests are coming back in the clear, but your fish are regularly sick (i.e., ich, pox etc. ), increasing the frequency or volume of water changes may help resolve the problem. In this instance, the illness may be spurred on by an increase in free-swimming harmful bacterium or parasites in the pond, which regular water changes can help reduce. When is best to Perform Seasonal Water Changes? Water changes help reduce ammonia and nitrites, which can be useful before winter hibernation and early spring. Small water changes should be carried out on a regular basis throughout the entire year, but it can also be helpful to perform a much larger water change as a kick-start to a new season. Good times to perform larger water changes are before a new season starts, such as before summer or at the end of autumn, which will help “refresh” the system in preparation for changing conditions. These water changes are usually between 50-70% total pond volume, and although that can seem like a lot, it can be very beneficial during times where external environmental factors begin to play a role in water conditions. For example, at the end of autumn you should begin “winterizing” your pond in preparation for your koi’s topor (“hibernation”) period, which includes general cleaning, maintenance, and management duties. As well as this, autumn is a good time to perform a large water change, as it will help reduce a large chunk of free-swimming waste substances that have likely accumulated through the debris-heavy season. It will also help reduce free-swimming pathogens, bacteria, and even parasites, which can all cause major issues for koi during hibernation. Another good time to refresh the pond would be late spring or early summer, as a large water change can help increase dissolved oxygen levels in preparation for warmer weather, and also reduce any algae particles that may be lingering in the pond ready to bloom for summer’s sunlight. So long as the water is dechlorinated from both chlorine AND chlroamine, a large seasonal water change should have no negative effects on the system. Note: We do not recommend performing large water changes in peak summer unless you can slightly heat the water, as it can stress fish due to the rapid chill. Note: Pond water is extremely high in natural fertilizers, such as nitrates and phosphates, which your garden plants will love! Instead of putting the water down the drain, you can use it as a very effective fertilizer for garden plants, vegetables, shrubs, and even trees. Although designed for cleaning, pond vacuums are also very effective at removing pond water during water changes. The first step to performing water changes is draining the necessary amount of water, with the most suitable method being dependent on your pond size and the volume of water change. For koi ponds, or ponds above 500 gallons in volume, the easiest way to carry out regular water changes is with a pond vacuum with am automatic discharge function. High quality vacuums are incredibly powerful machines, and can easily remove 10% water volume within a few minutes of operation, even in the largest of ponds. The main reason we would choose a vacuum over a submersible pump for water changes, especially in koi ponds, is the fact you can perform some pond liner cleaning as you carry out the water change. Keeping sludge and bottom muck under control ensures waste substances don’t build, and it can be a tough job with large fish stocks. If you’re performing daily-weekly water changes anyway, it makes sense to achieve both goals at once using vacuum. Many vacuums also have a handy discharge function, so you simply position this into your garden or drainage system and the water will automatically be moved from the pond – no emptying required. Alternatively, if your pond doesn’t require much in the way of cleaning, you can simply position your pond pump’s out-take pipe into the garden or drain. If you have a submersible pump with flexible hose, this is obviously much easier. If you have an external pump and a rigid pipe framework, it may not be as easy without the use of special valves and extra pipework for dedicated water changes. For very small ponds, such as goldfish ponds, you can make use of your submersible pump, a solar powered pump, or even a manual hand-vacuum. All should be sufficient for removing small amounts of water without too much hassle. carbon hose attachments help dechlorinate water directly from your garden hose as it passes through. Regardless of the size of your water change, mains water should always be dechlorinated to reduce stress on the eco-system. After draining your pond, you’ll now have to re-fill it, but before doing that you’ll need to consider how you’ll treat the water for chlorine and chlormaime. For most pond owners, re-filling the pond directly from your garden hose will be the easiest solution, but this also means you’ll be placing chlorine directly into the pond. To workaround this problem, I recommend installing an activated carbon catalyst to the end of your hose, which will remove both chlorine and chloramine as the water passes through the attachment. These hose attachments contain the same type of activated carbon found in filter box media, and work great alongside their filter box counterparts to remove heavy pollutants from tap water. To get then most from your water changes (and wallet), a high-capacity carbon attachment is best so you can carry out a large number of water changes before needing to replace the material. After fitting a carbon attachment to your hose, water can be added directly to the pond system. If you’re planning to re-fill the pond from a holding tank/barrel, water can be treated with a water conditioner product within the holding tank before it’s placed back into the pond. Alternatively, these kind of products can also be added directly to the pond after re-filling. Although very effective at removing chlorine and chloramine, they won’t be able to remove these substances immediately, so if you’re treating the pond after re-filling your fish may become stressed for a short period as they adjust to the changes. In most cases, as long as your water change is within 10-30% by volume, there shouldn’t be any major problems if the water conditioner is added while new water is being added. As some older products only remove chlorine, so you’d need to select a conditioner that neutralizes both chlorine and chloramine to be on the safe side. From personal experience, we recommend either API Pond’s Chlroine and Heavy Metal Neutralizer or Pond Prime’s Chlroine & Chloramine Remover. Koi clay can be useful for replacing trace minerals which may be absent in very soft mains water. After choosing a method of dechlorination, it’s time to replenish your supply by adding mains water back into the pond. If you’re running a carbon hose attachment, water can simply be left to re-fill to the appropriate level. If you’re adding water back without an attachment, water conditioners should be added during the re-fill process to ensure chlorine is removed asap. After re-filling the pond to the desired level, you can supplement the pond with beneficial bacteria products to replace any bacteria lost during the water change, or add Calicium Montmorillonite Clay (“koi clay”) products to replenish trace minerals. If you live in an area of particularly soft water, adding koi clay to the water after heavy water changes will help replenish minerals fish need that may be absent, in soft water, and will also work to further detoxify water from pollutants. A final thing to mention here, especially for those of us who use a garden hose or mains pipe to re-fill our ponds, is the addition of an automatic water control method for maintaining stable water volume. When re-filling large ponds, it can be easy to lose track of time and overfill, so having some form of safeguard in place can save both time and hassle. In most cases, a basic float valve can be used as an attachment to your mains hose, which will cut off water supply when the float reaches the desired level. Alternatively, both mechanical and electronic automatic water re-fill devices can be installed for even easier water level control and re-fills. Regardless of device, once water has been removed from the pond during a water change, the pond will be re-filled to the desired level automatically. Combine this with an activated carbon attachment (for hoses), or carbon filter media (for pipes), and you have a semi-automatic water change process. For more information on these kind of devices, check our dedicated article here. Water test kits are useful for determining water quality, which can help improve your water change routine. Testing pond water should be a regular part of any fish keepers routine, and good times to test water quality are just before a water change and a few days afterwards. Performing a water quality test every few months before and after a big water change will allow you to compare results to see if the change has had an impact on ammonia, nitrites, and nitrate levels. Likewise, if you’re unsure if you need to carry out a water change, you can use a testing kit to determine your current ammonia and nitrate parameters. If your testing is showing low ammonia and nitrates, a water change may not be immediately necessary and can be delayed to a more appropriate time. Regular testing water is also useful for creating a personalized water change routine for your pond and koi stocks. There is no “magic number” when it comes to water changes, so the best way to determine the optimal frequency would be to carry out regular quality tests and adjust water change frequency/volume based on waste substance levels. If you’ve never tested water quality before, or just don’t test regularly, you may be surprised just how good (or bad) your water parameters currently are. This could indicate your water change routine is far from optimal, or it could mean you’re doing a bit too much, and may have the luxury of less frequent changes in future. Either way, if you have koi or goldfish, you should make it a habit of testing water quality every few months, or around the time of a heavy water change or treatment. Testing helps optimize your water change routine, which will lead to healthier and stronger koi in future. Glad you like the website! How cold is your well water? If the fresh water was much colder in comparison to the pond water, the koi may have some slight temperature shock and could need some extra time to acclimatize. I was just wandering if I should do a 100% water change and clean the whole pond if my ammonia levels are at a 2.0? My pH, nitrates, and nitrit’s are all very well and low though? My one fish has been acting weird and laying on its side so I did a 50% water change last night, put in Tetra Pond/Fish Treatment, and put ammonia detoxifier in the pond and he’s getting healthier again but he’s still not acting right? It’s not swim bladder ideas and 2.0 ammonia level is dangerous so I’m thinking it’s that? My pond is 275 gallons. That ammonia reading is fairly high, so I’d definitely try to determine what is causing that as a first priority. What kind of filtration do you have in place? Is this a new pond? How many fish (and what species) do you have? If you have lots of sludge on the bottom, it’s actually good time to clean that before winter arrives. Also, performing a large water change could be beneficial to quickly resolve the problem. Personally, I’d check all filtration equipment, give it a clean if necessary, remove excess bottom muck, perform a 50-75% water change, and then re-test water quality a few days later. If this doesn’t help, but ammonia is now lower, I’d treat the pond for parasites as they’re a common cause for unusual swimming behaviour at this time of year.